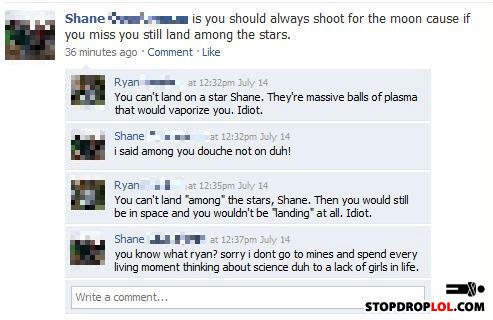 Ryan= nerd. Shane= gayer than a handbag full of rainbows. Shoot for the moon, if you miss, you'll burn up on re-entry. Lol is this Ryan Higa and Shane Dawnson? Ryan is awesome! Totally PWNED that guy! Also, the moon is a lot closer than any star, including our own sun, so were you to land among them, you REALLY overshot the moon and underestimated your shooting abilities. I thought you shot for her heart... so she couldn't pregnant! What did cancer get for Christmas?